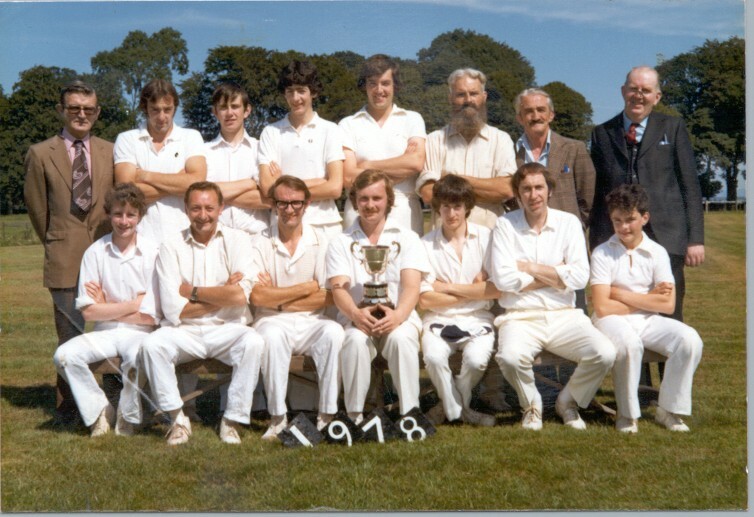 The death of Dermot Edwards of Bushfield, Lismore and formerly of Burwarton, Shropshire, at the age of 86 at Conna Nursing Home on Friday 13th May severs a connection that goes back to the beginnings of Lismore Cricket Club at the start of the 1870s. Born John Robert Dermot Edwards in early 1930, he was the son of Richard Barton Corbett Edwards and Mary Constance Godfrey. His connections with Lismore came through his grandparents, Sir John Ernest Godfrey and Lady Eileen Mary Godfrey (nee Currey), who lived in Bushfield; indeed Lady Godfrey died there in 1971 at an advanced age. His Great Granduncle Francis Edward Currey was agent of the Duke of Devonshire in Lismore Castle, and his son Chetwode H. Currey is recorded as being Hon. Secretary of Lismore C.C. in 1872. In 1977, after his grandmother’s death Dermot, his late wife Gillian, and their 3 sons William, the late Bobby and Jamie, moved to the old family home in Lismore from Shropshire. Though he played cricket throughout his life, in Shropshire and in Saudi Arabia on matting pitches laid on concrete, where he worked in the electronics area, Dermot’s played his first cricket match with Lismore on 13th May 1978. He played no small part in Lismore winning the Munster Junior League later that year. The following year he scored 102 not out in a Junior League match v Cork Harlequins at Farmers Cross. Many will remember his old style batting gloves, which had to be carefully strapped on each hand but allowing the bare hands to hold the bat and his cricket trousers in which he held up with an old MCC tie serving as a belt. He continued to play on well into his 70’s and was a fearless fielder especially at silly mid-off, until he finally hung up his boots. Of course that did not finish his involvement in cricket with Lismore and beyond. He continued lovingly tending his sacred patch, the pitch, with his various tools and implements, especially his witches broom, which had to be used in the correct direction – was it brushing left-to-right or right-to-left?, eradicating any weeds that had the temerity to invade the batting square, umpiring and generally keeping everyone in order and preventing them losing the run of themselves aided and assisted on all such matters by the late Dennis MacKintosh and his good friend John Ind. In the 1990’s he was elected as President of Lismore CC and remained so to the time of his death. He was also a former Vice-President of the MCU for many years. He was very much a cricketer of the “old school” and a long-time member of the MCC. He had little time for or understanding of the innovations of the modern game. Limited overs cricket matches had no attraction for him and the introduction of coloured clothing he regarded as a step too far – pyjama cricket was his description. He also couldn’t understand why cricket clubs couldn’t make the effort to have turf pitches; he had a strong dislike of playing on artificial pitches, which he described as “magic carpets”. These were totally unsuitable for his old style cricket boots with spikes of course, which tended to get stuck in them. Goodness knows what he thought of the arrival of T20 cricket - that is probably something best left to the imagination! No, rather he loved “real cricket matches” whether timed matches, 3 day county matches or 5-day tests; especially at Lords, where was regularly shown on the TV screen in the Members area near the entrance to the Pavilion, with his W.G. Grace-style full beard, MCC hat, blazer and tie. Lismore (1978) - Dermot Edwards is pictured 3rd from right in back row with a rather young looking Michael Hickey to his right. Dermot’s wife Gillian died in 2005 and his son Bobby died tragically in 1995. He is survived by his sons William, who lives in England and Jamie, who lives in New Zealand and by his 5 grandchildren, to whom, together with his other relatives and many friends we express our sincere condolences. His funeral service will be held in St. Carthage’s Cathedral, Lismore at 2.30pm on Friday 27th May, after which he shall be buried with his wife Gillian in the adjoining cemetery. O my Hornby and my Barlow long ago!